Nice to hear that you are feeling better ! look forward to more information. I'll keep you informed Gayle. I am happy with the results and hopeful it will help my little girls. If it works, do it! It has been a pleasant surprise Joanne. Most of it comes from Colorado and California, from large manufacturers. They've been doing it for quite some time. It isn't someone doing it in the back storeroom. I wish they would legalize it here in Texas. Most people in states where it is illegal go to Colorado or California to get it and bring it back on airplanes. TSA doesn't care or have the manpower to worry about it. It's all over TX. You can get it in tattoo places and massage therapist places. That's where we got it at first in Dallas. They even have the THC gummies etc. I got my last jars from a massage therapist that buys it from CO. I got a deal for buying multiples and it came via FedEx. We first heard about it at MD Anderson with my sister. Big deal in cancer research. People were flying to CO and CA for it. Hope it gets legalized all over. So ridiculous. Did you ever get that wallpaper I identified for your Donna? Rachel, I had that advertisement out two days ago and I still love it for the powder room. It isn't sold in the USA. Boo! 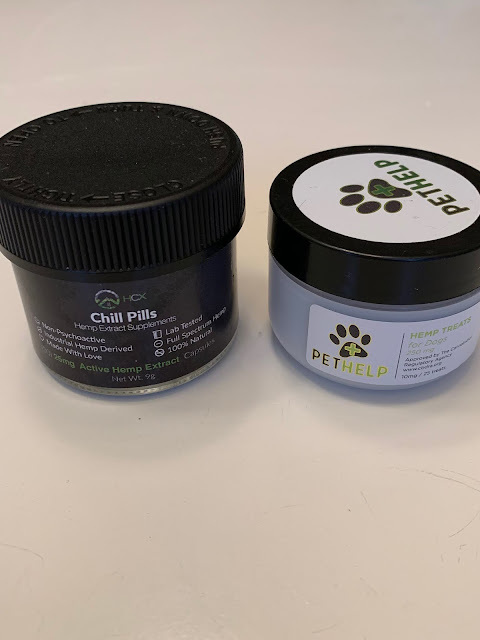 I have started using CBD capsules since hurting my foot. It helps with feelings of stress, to a degree, and I'm grateful. I'm glad to read that you find CBD a help as well. Bea, I was pleasantly surprised. I have not used it for pain, so I can't testify to that but I am sold on it for the things I mentioned. I have an appt in February to find out more:)Good for you!! I am sure there are numerous tweaks to the dosages and amounts of thc included. And, to think as a hippie I smoked it with abandon. It is a different day now though. I tried one of my sister's gummies (half of one) and I was tripping. It was so strong I got paranoid and couldn't wait for it to wear off. Not doing that again. My sister takes two capsules a day. Fingers and toes crossed those very positive improvements continue. And grow. I hope so too Child. I am sure the shops know a lot about different combinations and brands. It is big business now. Yay Yahoo and Whoopee SOOOOO happy for you. Me too. I forgot something else to tell. It makes me not hungry. If it had THC I'd be eating the bark off of trees. I have heard others that use it for pain and also dog owners whose pets are arthritic. I'm convinced it isn't snake oil, and keeping an open mind. Sign me up!! I need some happy potion - seems like anything and everything ticks me off these days! I think it is going to be as common as vitamins. And, who know what different combinations will provide. I want to go to a cannabis 'pharmacist' who is experienced in the products. I always avoid pills of all kinds but occasionally I have to admit they do some good! Jenny I am of the ilk who would drink gasoline if I thought it would help. I am optimistic this is a helpful, healthy option. Yay for you! I'm so glad it's working for you. I keep trying the liquid but it usually gives me a headache... and tastes terrible! Might have to try the gummies or pills. But the topical for pain works perfectly! Kirsten, thank you for telling us about the pain aspect which I don't know about. I bet if you took the capsule or gummy before bed you probably wouldn't get a headache.